SFF Books You Wish Were Adapted for Screen. There’s so many more of us out there now, it’s hard to keep track, so let’s share the love and help everyone find each other. Best and worst places to live in SFF. Which magical lands and alien cultures would be heavenly abodes, and which would be your nightmare? Your favourite friendships in SFF books. And which character would be your BFF? What are you voting for? Campaign for your faves! 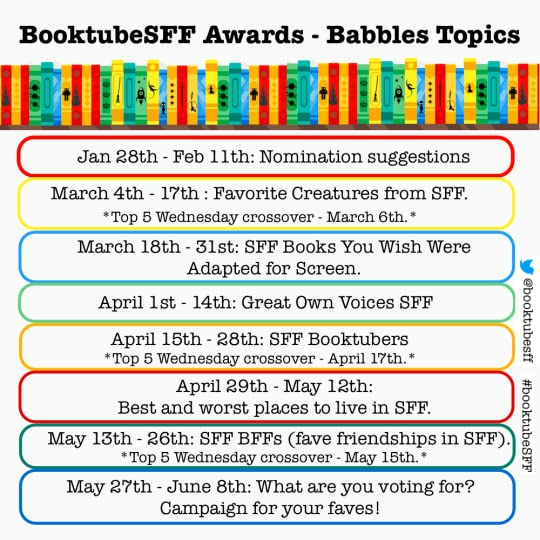 If you'd like to post the official #BooktubeSFF Babbles Topics on your blog or instagram then feel free to use this image.